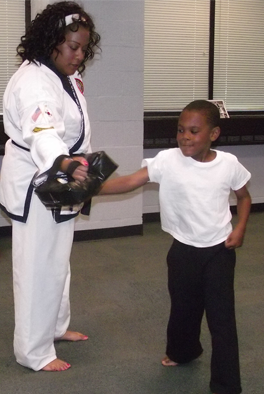 Ms. Stephanie Pinkney started her martial arts training after enrolling her son Mikael into karate. He inspired her to join in January of 2011. After earning her purple belt she was encouraged by her instructor, Master Mundy, to further her training to earn a black belt and become a Tang Soo Do instructor. She tested and promoted to 1st dan in March of 2014. Ms. Pinkney currently teaches and inspires students in Saturday childrens’ classes at Beech Woods Rec Center in Southfield.